3 Lane change to the right (push and hold the lever partway) The right hand signals will flash until you release the lever. 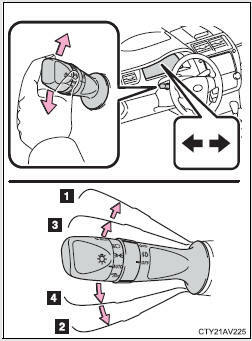 4 Lane change to the left (push and hold the lever partway) The left hand signals will flash until you release the lever. Vehicles without a smart key system: The engine switch is in the “ON” position. Vehicles with a smart key system: The “ENGINE START STOP” switch is in IGNITION ON mode.